A man and his preschool-aged son walked into a gelato shop on Baldwin Street last Monday with no apparent idea of what they were about to experience. I was outside on a bench in the shade at the time with a pair of friends who were lost in their flavours: fresh guava and plum salt, green tea and Chivas, super-ripe mango that hit with a fiery gust of bird’s eye chile. The father and son emerged a few minutes later and sat down, the kid’s eyes a storm of confusion. They had purchased one cone only. The father was eating it. Sorry, kid. 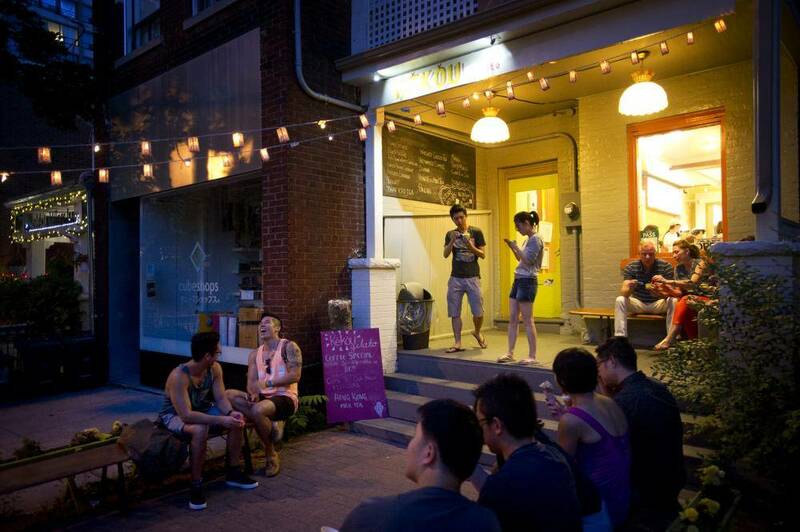 This little gelato shop makes gelato for grown-up tastes. 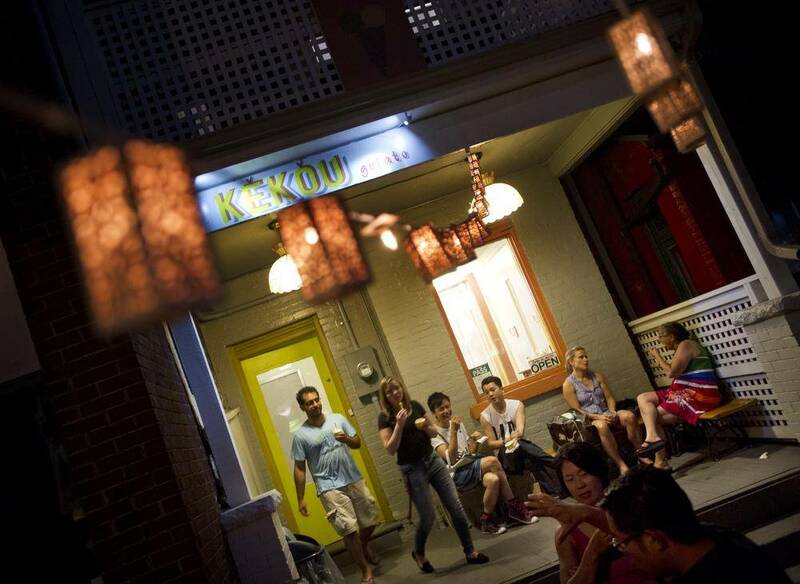 Kekou’s flavour lineup reads like a stroll through an Asian night market. In the year since the shop first opened, its tamest selections have included lemon-chrysanthemum, ginger milk, jackfruit and green bean-coconut. (That last one, a riff on a classic Vietnamese iced drink, is incredible.) The chocolate gelato, when they make it, is spiked with wasabi. The shop’s vanilla gelato comes blended with lotus seeds. Kekou’s owners and gelato makers, Yik Sin and Elissa Pham, both grew up in Toronto, with new-immigrant parents. Mr. Sin’s mainland China-raised family fed him jackfruit, soursop and durian whenever they could get it. Ms. Pham’s Vietnamese-Canadian family had slightly different flavour touchstones: sticky rice, avocados blended with banana, coffee mixed with sweetened condensed milk. Though they’re lifelong ice cream freaks, until Kekou, neither Mr. Sin nor Ms. Pham had much experience in the business. (The partners took a four-week course in Bologna, Italy, at the respected Carpigiani Gelato University.) That inexperience doesn’t seem to have hurt their shop in the least. Gelato is more than an Italian way of saying ice cream – with origins in Sicily, it’s a different product entirely, with much less fat (gelato typically contains more milk than cream) and far less air churned into it. It’s denser, more strongly flavoured and melts less quickly. At Kekou, the gelati (and the sorbetti) have another important attribute. They are remarkably clean-tasting. You take a bite, the flavours come through in a wallop, and then everything disappears, without frozen dairy’s all-too-common manky echo. Kekou’s gelato doesn’t contain stabilizers, which even some of the world’s best gelaterie use. I’m not sure if that alone is what makes the difference, but either way, you should get there. You’ll be too busy swooning to care. The Vietnamese coffee gelato is superb, a world away from the gritty coffee ice creams that are often made with Nescafé powder. The peanut-sesame is brilliant (if also completely wacky to my taste), and the whisky-green tea tastes exactly of its namesakes, because that’s exactly what it’s made with. You shouldn’t go to the shop without trying the guava and plum salt – a common combination in Taiwan – as well as the soursop sorbetto, which comes on green and high-toned and gorgeous, like the spiky, white-fleshed tree fruit it’s made with, and then vanishes as soon as you swallow. And a note to parents: Kekou does make an excellent strawberry-lychee sorbetto. It’s smooth and sweet and sour a little, fresh summer fruit with a subtle lychee descant. Just maybe wait to mention the lychee part until the kids are done. A few blocks west on Baldwin Street, at the edge of Kensington Market, Millie Creperie is also run by amateurs. Carson Leung, 24, and Christinn Hua, 25, have no real chef’s training; though Mr. Leung worked briefly as a line cook in Mississauga, he is far more of a home cook than a pro one, he said. They’re well-traveled food nerds who had eaten at Per Se, Eleven Madison Park and Le Bernardin before reaching legal drinking age. In Japan a few years ago they couldn’t help but notice the crowds outside Tokyo’s crepe shops. The crepes were thin and crisp, rolled into cones around oddball mixes like ice cream with Pocky and chopped fruit. Toronto, they decided, was missing out. Millie opened a year ago this weekend. It is tiny – 200 square feet – with just a few tables and a pair of crepe pans in the window. The crepes, cooked to order from flour, eggs, sugar and milk, are thinner and slightly more crisp than the buckwheat variety from Brittany. Eating them, you’d never know just how amateur the couple are. 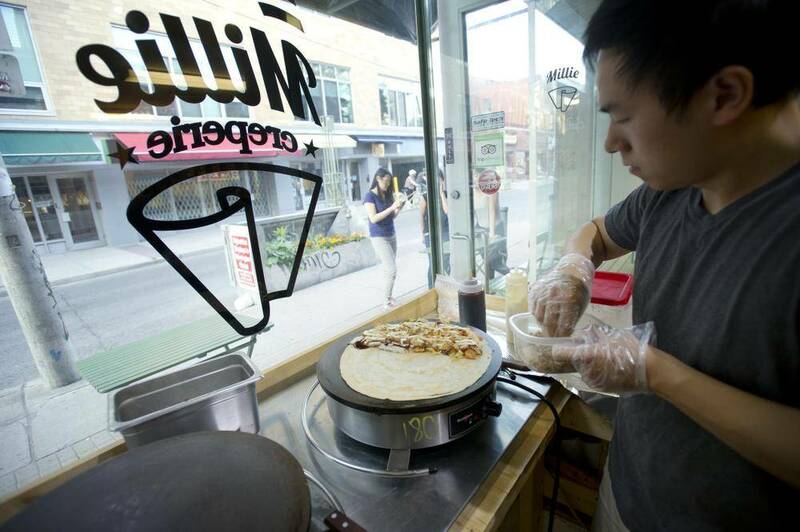 Millie’s savoury crepes are superb – fast, tasty, way out-of-the-ordinary takeout. There are Thai chicken crepes, and vegetarian ones the menu calls “rabbit food.” The pork and Corn Flakes crepe is emphatically weird but also very good. The must-get crepe on Millie’s savoury menu is the pork okonomiyaki. It comes stuffed with sautéed cabbage and carrots, tender, miso-braised pork belly, kewpie mayonnaise, okonomiyaki sauce (a mixture of Worcestershire, ketchup and soy, effectively), and the shaved, dried bonito flakes called katsuobushi, which taste a lot like Spanish ham, but from the sea. The desserts here get all the attention however, and they ought to. 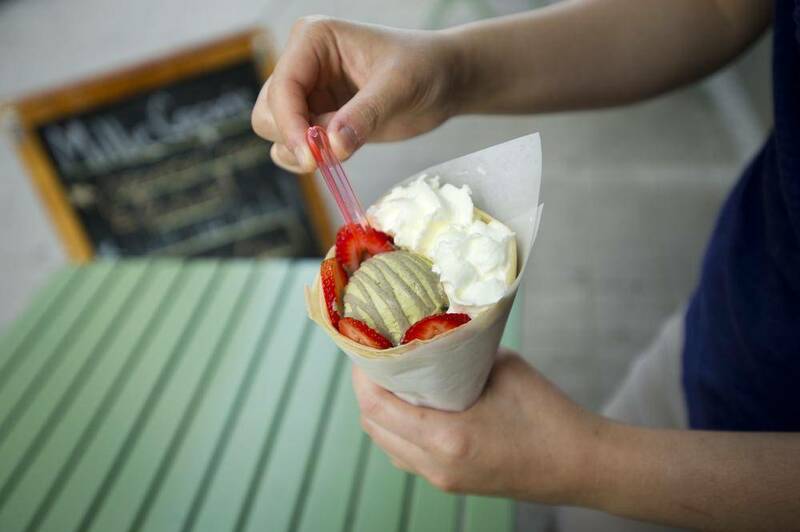 The Japanese special crepe comes filled with a ball of Mr. Leung’s excellent green tea gelato, as well as sliced strawberries, red bean paste, a sauce made from matcha tea, and whipped cream. There are endless variations on the theme here, including a parfait that’s dressed with Pocky sticks and Corn Flakes, and simple but effective banana and Nutella crepes. 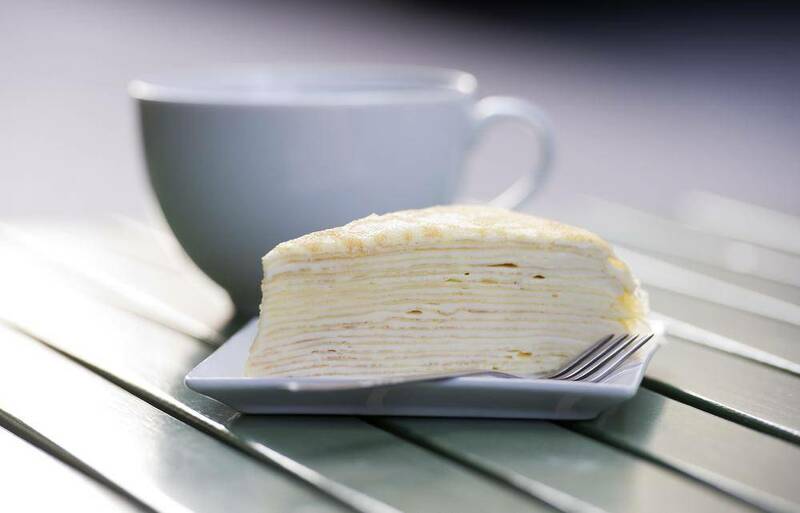 But the best thing in the shop is Millie’s sublime mille crepe cake, a stack of 20 crepes with a mix of subtly sweet vanilla pastry cream and whipped cream between every layer. It takes Ms. Hua more than three hours to make just one of them, she said. There’s a reason you almost never see mille cakes around town. While I can’t promise that you’ll get one, it’s a worthwhile goal for a mid-summer’s weekend. Worst-case scenario, you get a freshly made crepe filled with sweet, creamy weirdness and chopped fruit, Pocky sticks or breakfast cereal. Go with it. It doesn’t taste like a consolation prize at all.